I have been a bit of a late entrant to the MAC makeup world, and even now, I hardly own anything much from the brand. I just find the range of colors, products, and formulations so overwhelming, and it doesn't help that most MAC counters I have gone to have these perfect-looking SAs like they just stepped out of some YouTube makeup video - it's all a little too intimidating! I do have a few MAC eyeshadows, though, that I really, really like and have been using a lot of ever since I bought them. Mostly mattes and neutrals, and MAC Swiss Chocolate is just that. MAC describes this as a muted reddish brown, and this is a matte shade. 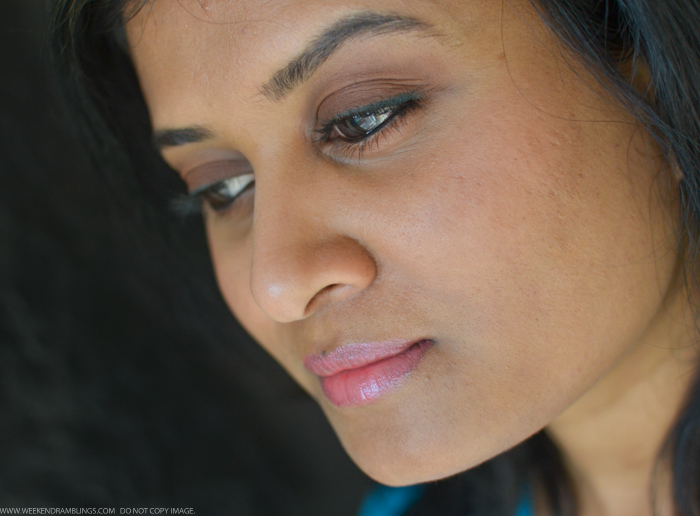 MAC Swiss Chocolate - Swatch on my darker Indian skin tone. Eyes: MAC Swiss Chocolate all over lid and along lower lashline. MAC Saddle and Soft Brown to blend out edges. MAC Siahi Fluidline along upper lashline. Urban Decay Perversion waterline. This is one of my favorite eyeshadows - MAC or any other brand - because of a couple of obvious reasons: It's matte, and it's a warm-toned brown. Most beige/brown/taupes tend to look ashy on my eyelids because of the natural discoloration that I have on my lids, and the warm reddish tones in this shadow do a perfect job of neutralizing that and showing up quite true to color. 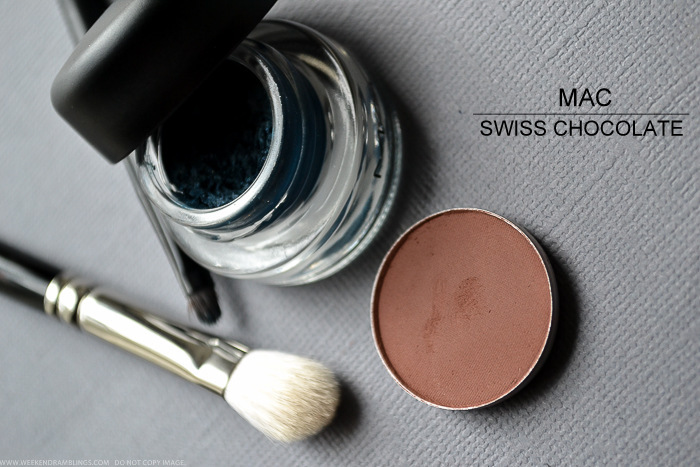 Despite being a darker shade, because it's a matte shadow, Swiss Chocolate is also much more "natural" looking. I can use it either as an all-over lid color, like I have in the photo, or use it to blend along the crease. It makes for a nice transition shade (at least on my darker skin) and helps blend out the edges while doing a darker smokey eye look. It doesn't look all that very pigmented on my swatch but does apply beautifully with a brush and is quite easy to blend out too. Over a primer - I always use one - this eye shadow lasts the whole day long on my eyelids. 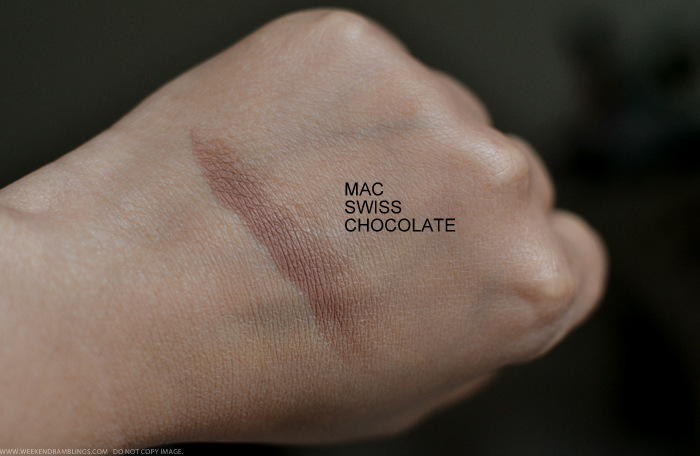 If you like neutral shadows and/or are just starting off with some basic eye shadows, I think Swiss Chocolate would be a nice shadow to try, especially if you are somewhere around my skin tone. hey... I have not yet entered the MAC world :P.... but your review is definetly tempting me to soon get my hands on it!! Oh man, I had this in my recent Mac shopping basket but tossed it out just before checking out. (Because I don't tend to use my Mac shadows much and I've just bought Nars Narsissist). Now you have me drooling again! I love this look on you, the soft pink lip, the eye look, and how beautiful Taos (which can be quite gaudy on me if I'm not careful) looks on your cheeks. I think this would intensify/complete a look I like to make with Mac Sable, Soba, and Ricepaper. Do you think so? Taos is pigmented, but I have been using the Suqqu cheek brush of late, and it does a fabulous job at softening colors. Swiss Chocolate looks like a great neutral and I love how you paired it with the vibrant liner. That's beautiful. I think I've been overloaded on all the LE releases that at this point I never even bother looking at their regular permanent range, but like with Swiss Chocolate, it looks like there are some great colors in the line to check out! Caramel doesn't really give any better coverage..but it does help knock out some of my dark circles .. Speaking of MAC, although they have a great range of products and I do agree - it can be overwhelming - I've had great luck with one particular SA in one of the stores near where I live. She kind of let me stand there at her counter for up to 30 minutes sometimes, just swatching and playing with the colours until I actually asked her for what I wanted. That's how I kind of got over my feelings of being overwhelmed by their range and SAs. Oh you sound just like me! I have the hollows too..it's so frustrating watching videos on "covering dark circles" with people who have flat undereye areas grrrrrrrrrrrr... I got the YSL Touche Eclat ..is that similar? It's great for highlighting, but it has these microscopic shimmer particles in it - probably not very visible to most people, but I am always on a shimmer alert and notice even the tiniest bit so fast, and I think it's a little more "radiant" than I would like it to be. this is one of the must have shades from MAC! its in my wish list :) I love brownscript as well..its a gorgeous reddish brown and looks very flattering!